Protestors gather outside the hotel where Republican Representative John Faso was scheduled to speak in Schoharie, New York. Credit: YES! Magazine/Reggie Harris. I’m leafing through a stack of protest signs in the corner of the mudroom, reading the markered letters, looking to see what can be recycled for tonight. The subjects we’ve collected thus far are about human rights and the environment. It looks like we’ll need to draft something fresh and new for tonight, because the topic is health care. Our Republican congressman, John Faso, has an 89.7 percent track record for voting “Yes” on Trump initiatives. 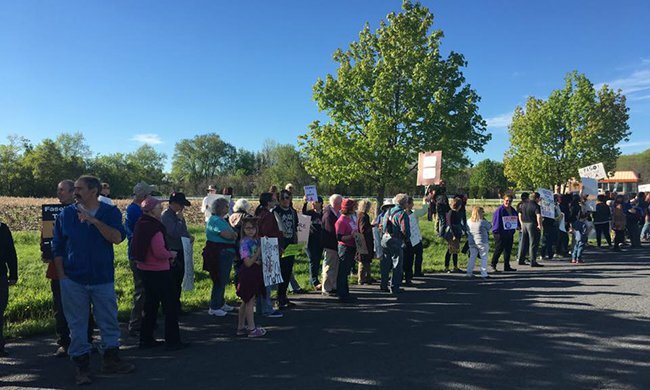 He hasn’t been holding town meetings with constituents, he and his staff have stopped responding to letters, I’ve never had a phone call even answered, and his recent vote to repeal ObamaCare in the House has sparked this last minute protest down in the village of Schoharie, New York, where he’s the keynote speaker at a countywide Republican fundraiser. I’m not a big fan of crowds. I don’t even like meetings. But the elections last November showed me that even introverts need to emerge from their shells and make their voices heard. As much as I dislike and distrust our current national administration, I also deeply value community harmony. Where national politics and economics fail, I have a deep belief that local community can survive. But Trump won Schoharie County by a margin of 3-1. And the past few months, for me, have been tough. I don’t like to disagree with my neighbors. I’m one of those people who waves at every person driving down our rural roads. I like to talk about the weather, about local issues, about who’s having surgery, about whose daughter is coming for a visit, about who’s cleaning out their garage, who’s having a baby. I can remember those things and carry on intelligent conversations. When it comes to national politics, however, I’m completely rattled. In the face of someone who disagrees with me, I’m so flustered by the lack of harmony, so worried that our friendship could be fractured, I lose my ability to be articulate about issues. But national politics, in my estimation, are now dire. Too much is at stake for me to spend all my time in my comfort zone. Saoirse and Ula are following the issues now, too, and it would be irresponsible for Bob and me to encourage political discussion at home, but then fail to empower them with the democratic tools available to them to influence change. So I’ve chosen among my discomforts: rather than talking one-on-one with my neighbors about my feelings and opinions, I’ve been pushing through my anxiety about being around lots of people. Part of me wonders whether my choice to stand among like-minded souls is more cowardly than talking one-on-one, but I cut myself some slack. It’s better than doing nothing. On this spring evening, Bob, the girls and I write catchy phrases on the backs of some of the other protest signs we’ve amassed, load into the car, stop at the bank, stop at the grocery store, then make our way to the protest. One hundred eighty-five of us have gathered outside the hotel where Congressman Faso is scheduled to speak. That’s a big crowd for a rural Republican county, especially since this all came together at the last minute. Bob, the girls and I walk toward them, and we’re greeted with hugs. We stand among friends, comforted by each other’s presence. The sky is blue, and the sun is warm on our backs. Attendees for the fundraising dinner begin to drive by. We hold up our signs. The drivers don’t make eye contact. A few flip us the bird. Bob Neid, our organizer and local agitator extraordinaire, holds a megaphone to his lips. “Tell me what democracy looks like!” He shouts. And we all know how to respond, no coaching necessary. For a little while, no one drives past headed for the dinner. Being a great lover of the written word, I’ve found in the past few months that protest signs are their own literary form, and I’ve come to enjoy reading them. While it’s quiet, Saoirse and I take off down the line to appreciate the creativity of our fellow protesters. As we walk, I meet up with farm customers, former teachers, and a lot of people I’ve not seen in years. We laugh, we share design tips for reusable posters. Some people turn their signs around and show on the back the list of every protest they’ve attended this year, the way others might collect spoons from tourist destinations. Hey Hey–Ho Ho, John Faso has to go! Healthcare for all, big and small! And then some fellow farmers drive by, their big pick-ups shiny and clean for the evening. “Tell me what democracy looks like,” Bob Neid chants. I know a lot of them. In one truck, I see a couple I’ve known my whole life. They helped me do my master's research. They helped me do my dissertation research. They recognize me. We lock eyes. Is this confrontation? Is this the very thing I’ve been trying to avoid? He gets a little twinkle in his eye and gives me a nod. She smiles widely and waves at me. Then I begin to laugh. I forgot! He’s a Republican. She’s a Democrat. Now they’re both laughing, too. “This is what democracy looks like!” The crowd cheers back. And then I hear it up and down the line. “Hey! That’s my neighbor!” Another protester lifts his arm and waves to someone else driving down the line. “Looks like he’s feeling better after his surgery!” Another little wave back from the car. “Hey! Those are my neighbors! I didn’t know they’d be coming out to something like this!” Another nod. Another wave of greeting between protester and Republican driver. I discover a new comfort zone. I am who I am. I believe what I believe. And all of us in that line are facing the same thing: public dissent, when harmony is a matter of rural culture, survival, and quality of life. But with the support of fellow citizens who share our opinions, we find the courage to speak up about these issues that we find appalling. And then, on the other side, we see our neighbors. And all those nods, all those little waves on the road, all those pleasantries at the grocery store, become hugely valuable. For the sake of preserving relationships, direct words may not be exchanged. But the communication is happening nonetheless. Maybe it’s imperfect. Maybe it’s provincial. But I’ll own it. In Schoharie County, this is what democracy looks like. This article has been re-posted from YES! Magazine. It was originally published in The Radical Homemaker.